How can I log in and out if I already have a profile? 1) Click the Log back in! link, located on the top right of every Portal page. 2) Click the Retrieve Password link, located below the Login Name and Password fields on the Login page. 3) Enter the email address you used when you originally created your profile. If you enter a different email address not in the system, your password will not be retrieved. 4) Check your email, and click the link provided to follow the reset password steps. How can I search for a job? 1) Use filters to search for open positions that match your specific search criteria on a company’s Career Portal. 2) Click Search to view your results. The filters may include Keywords, Location, Category, and Position Type. Choose Zip Code from the Location menu to display a Zip Code field and radius option. If you choose to use more than one filter, the search results must meet ALL of the criteria chosen. How can I apply for a specific job? 1) Select the title of the job that you wish to apply for. 2) Click the Apply for this job online button and follow subsequent steps on your screen. How can I apply for a job using a social media profile? 1) Access the desired job, and begin the application process. Click the appropriate Create with… social media button under the New Candidates section of the page. If you are a returning candidate, click the Log back in! link from the top right of the page or the log in link in the Returning Candidates section of the page to log in. Then, proceed with step 1, above. If you are already logged in to your social account, simply click the appropriate button to allow iCIMS to access your profile information. If you are not already signed up for a social account, you can sign up by clicking the Join Now or Sign Up buttons on the LinkedIn, Facebook, or Google+ pop-up. Tip: If available, select the checkbox beside Upload Resume at a later time to continue without uploading a resume at this time. Please note that you may need to upload a resume at a later date to have a complete application. How can I apply for a job using a resume? 1) Access the desired job, and begin the application process. Click Create with Resume within the New Candidates section of the page. 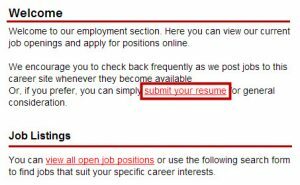 Tip: If you are a returning candidate, please refer to the steps in the How can I update my profile information (including my resume)? section of this page. 3a) To upload a resume from your computer or mobile device, select My Computer (or My Device) and select the appropriate file. Then, click open. 3b) To upload a resume from an existing Google Drive account, select the Google Drive button, login, and click Accept to allow access to your account. Finally, select the appropriate file and click Select. 3c) To upload a resume from an existing Dropbox account, select Dropbox, login, and select the appropriate file. Click Choose to continue. 4) Select Submit Profile to proceed with your application. How can I apply for multiple positions? There are no limits to how many jobs you can apply for. However, you can only apply for one position at a time. This means that after applying to your first job, you are able to return to the company’s main Portal page and select an additional position to apply for, and then repeat the process as necessary. Your subsequent applications will not require you to re-enter your resume or basic contact information, as this information will already be attached to your profile. How can I check on my status for a job I have applied to? 1) Log in to your existing profile. 2) Your Candidate Dashboard will display. Here you can review the positions you’ve previously applied to and also see the status next to the job title. How can I update my profile information (including my resume)? 1) Log in to your existing profile, and then select the Update your profile button. 2) Enter any updates to your personal information or resume, and click the Update Profile button. How can I submit my resume for general consideration (not to a specific job)? Submitting your resume for general consideration allows your resume to be placed in the company’s recruiting system without applying to a specific position. To do so, simply select the Connect with us or submit your resume link on the Career Portal’s Welcome page. 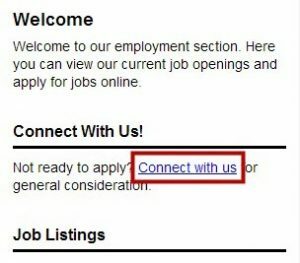 Tip: If this link is NOT available, you must apply for a specific open position and follow the normal application steps. 1) Select a job that you wish to refer someone to. 2) Select the Email this job to a friend button. 3) Complete all required fields, and then click the Submit Your Referral button. Both you and the person that you refer will receive email notifications with further details. If you are logged in, you will not have to provide your name or email when referring a friend. How can I connect with a company to receive updates on jobs, invitations to future events, and stay informed of opportunities? 2) Select an external social account to use the information there to pre-populate your profile, or select the Continue without one link to manually enter your profile. 4) Review the information parsed from your resume or social account (if applicable), and fill in any additional required information. Then, click the Save & Continue button. 6) Click the Update Interests & Log Out button to finish your profile. A thank you message will then display, confirming that you have connected with the company. Click Go back to our Career Portal on the Thank You page to search and apply for jobs, if desired. How can I receive notifications about new job openings? Applicants are able to create job search agents, saved notifications that alert them by email whenever a job matching their previous search interests has been posted. 1) Use filters to search for positions of interest to you, and click the Search button. 2) On the Job Listings page, which displays jobs that match your search, scroll down to the Job Search Agent Options section. Then, name your search agent and click the Create Agent button. How can I stop receiving notifications about new job openings? 1) Log in to your existing profile, and then click the Manage your search agents button. 2) Select the checkbox(es) for the agents that you wish to stop, and then click the Delete Selected Agents button. Search agents may expire after a period of time. (You will recieve an email notification before your agent expires.) To renew a search agent, follow the steps above, but select the Renew Selected Agents button instead of the Delete button in step 2. There is no way to modify an existing agent. To change the criteria of a search agent, delete the current agent and create a new one. How can I prevent a company’s emails from going to my spam/junk folder? Many email providers have increasingly stringent spam filters that can trap legitimate emails. This often includes emails sent automatically, such as job application confirmations or company newsletters; it can also include emails sent to you personally, such as interview invitations. If you notice that emails from companies you have connected with or applied to are going to your spam folder, you may need to adjust your spam filters. Links to some of the most common email providers’ help information regarding spam can be found below. IBM Notes (formerly Lotus Notes): How do I control spam and other junk mail?